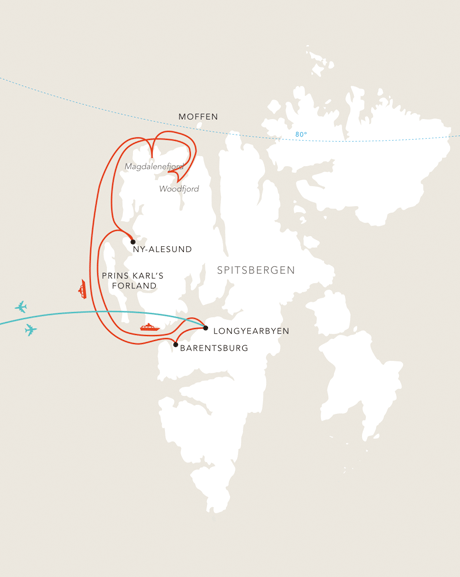 A 9-day voyage onboard the MS Nordstjernen featuring expedition guides and PolarCirckel boat landings. Day 1: Depart the U.S. – Depart the U.S. Monday or Friday transatlantic flights to Oslo from the U.S.
Day 2: Oslo – Transfer from the airport to downtown. Explore the city’s many sites, like the Akershus Fortress. View of the Prins Karls Forland from the water. 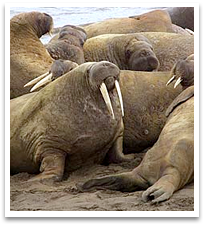 Part of the Arctic Adventure fauna, walruses sitting on the beach. Some homes on the hill from the Arctic Adventure cruise. Please Note: Itineraries are subject to change due to weather and ice conditions, and may differ from one departure to another. 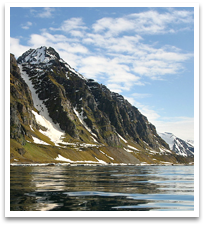 Also available, a 12-Day cruise onboard the M/S Lofoten. Travel along the West Coast of Spitspergen with calls in NY-Aalesund and Bockfjord. 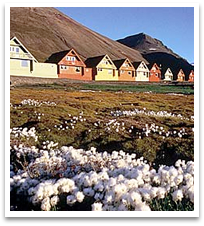 For more information, or to make a reservation, please contact our Arctic Cruise expert, Margreet Pettersen. 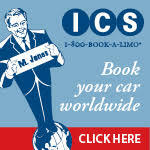 Margreet may be reached at 206-780-5010 or click to email Margreet. 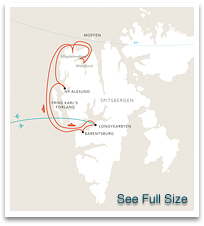 Itinerary route map for Hurtigruten Arctic Adventure Cruise.